Ajowan Co2 is a great extrat to use when fighting infection. Ajowan has long been used as a carminative, helping with many digestive issues. Ajowan Co2 is extremely antiviral as well as antifungal. It is also a bit analgesic to help with a slight numbing effect. We have used ajowan, both the Co2 and essential oil in many blends to combat fungal and bacteriacidal infections both topically and for respiratory issues. Ajowan is also known as Bishop’s weed. It is a small erect shrub and has soft, fine feathery leaves. The seeds are gray colored. Ajowan looks like wild parsley, similar to celery, caraway and cumin seeds and is native to India. The plant flowers in about two months and the fruit is harvested when the flower heads turn brown. They are pulled out, dried on mats and separated by rubbing with the hands or feet. Ajowan is known to be a warming, even "hot" essential oil and therefore possesses warmth and power for the energetic body as well. Ajowan can be used when we want to move stagnant energy or to rid ourselves of energetic parasites or "energetic vampires". As it purges and helps digest on the physical plane, it can also assist in helping us to digest feelings that may seem to be causing upset. Ajowan is used in Ayurvedic herbalism and considered to have warming effects for cold conditions that debilitate. Ajowan is antispasmodic and relieves abdominal pain or distension. It is helpful for stimulating the appetite and enhancing digestion The boiled seeds were used to cleanse the eyes and cure deafness. An old belief was that Ajowan seeds soaked in lemon juice and dried 7 times before ingested cured impotence. Ajowan essential oil and Co2 extract is similar in chemistry to Thyme ct thymol because of its high content of phenols (over 50%). It also contains a high percentage of monoterpenes y-terpinene (25%) & para-cymene (22.9%), which when combined with the thymol, synergistically support the anti-viral, antibacterial properties that this oil contains. Para-cymene is also known to be analgesic, thereby reducing pain as well. According to Tisserand & Young, Hazards of Ajowan essential oil include: may inhibit blood clotting; skin irritation (low risk); mucous membrae irritation (moderate risk). Cautions: Anticoagulant medication, surgery, peptic ulcer, hemophilia & other bleeding disorders. Maximum dermal level : 1.4% Dermal maxium is based on 70.2% total thymol & carvacrol content and a dermal limit of 1% carvacrol & thymol to avoid skin irritation. 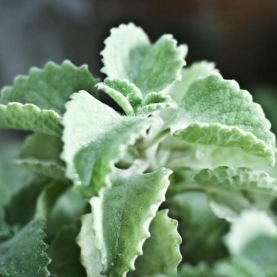 Ajowan's composition is similar to Thyme ct. thymol and is a potentially serious skin and mucous membrane irritant. Ajowan should be used in small dilutions, with carrier oil and on healthy skin.